All work on the section awarded to BSGR by a former Guinea dictator in 2008 and 50%-sold to Vale has been halted as the government of Guinea revisits all mining contracts entered into under previous regimes. "If the technical committee [reviewing past mining deals] recommends revocation and the government decides to accept that recommendation, Vale may lose its entire investment in the Simandou project subject to any rights to recourse Vale may have," the company said. Vale acquired the interest in Simandou from BSGR for $2.5 billion in 2010, but stopped payments after the first $500 million was forked over because certain progress milestones were not met. BSGR pegs the money spent on Simandou with Vale so far at about $1 billion. 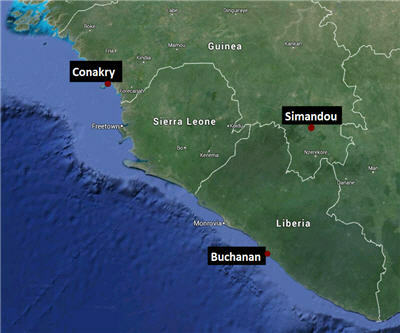 Earlier in March the Guinean committee reviewing the Simandou licences recommended the government strip BSGR as well as Vale of their rights because the panel alleges BSGR obtained the concession through corruption. Vale was not accused of any wrongdoing and BSGR has all along denied the claims maintaining that "the review has been conducted throughout without any respect for basic due process and procedural fairness." The awarding of the rights are also the subject of a separate Swiss, UK and US anti-corruption and fraud investigations.